Pakistan Museum of Natural History, Islamabad is a scientific organization working under the administrative control of Ministry of Science & Technology. PMNH intends to renovate Display Galleries and invite sealed bids from well-reputed Firms and General Order Suppliers having NTN, GST No. and are on Active Tax payer List (ATL) having experience in laying of Master (Glace Ceramic) Tiles (2’x2’) (A grader) Superior quality (Half Body) or Equivalent) in different public sector organizations. All interested Parties may send their quotations in sealed cover along-with 2% of the total quoted price as earnest money in the shape of pay order or Bank draft in favour of Additional Director (Admin) Pakistan Museum of Natural History, H-7 Garden Avenue Shakarparian, Islamabad on or before 25 th March, 2019 or next working day in case of holiday, upto 1100hours. The bids shall be opened on the same day at 1130 hours in the presence of the bidders / their authorized representative in the Committee Room of PMNH, Islamabad. The Tender Documents/BOQ may be obtained from www.ppra.pk websites or collected from undersigned during the office hours on any working day from the date of publishing of this Notice. Pakistan Museum of Natural History (PMNH), Islamabad is a scientific organization working under the administrative control of Ministry of Science & Technology (MoST), intends to purchase Scientific Equipment, Security Cameras, walk through gate, GIS License with hardware etc., invites sealed bids from well-reputed Dealers/Firms and General Order Suppliers having NTN, GST No. and on Active Taxpayer List (ATL) having experience in the different public sector organizations. All interested parties may send their quotations in sealed cover along with 2% of the total quoted price as earnest money in the shape of pay order or bank draft in favour of “Additional Director Admn”, Pakistan Museum of Natural History, (PMNH), H-7, Garden Avenue, Shakarparian, Islamabad on or before 15 th March, 2019 or next working day in case of holiday, up to 1100 hours and their bid will be opened on the same day at 1130 hours in the presence of bidders or their authorized representatives in Committee Room, of PMNH, Islamabad. The tender documents can be obtained from the undersigned on cash payment Rs.500/- (Rupees five Hundred only) during the office hours on any working day from the date of publishing of this Notice. Pakistan Museum of Natural History, Islamabad is a scientific organization working under the administrative control of Ministry of Science & Technology intends to purchase Scientific Equipments, and invited sealed bids from well-reputed Firms and General Order Suppliers having NTN, GST No and on Active Tax payer List (ATL) and having experience in the Scientific Equipments in different public sector organizations. All interested parties may send their quotations in sealed cover along-with 3% of the total quoted price as earnest money in the shape of pay order or Bank draft in favour Pakistan Museum of Natural History, H-7, Garden Avenue, Shakarparian, Islamabad on or before 15-11-2018 or next working day in case of holiday, up to 1100 hour and their bids shall be opened on the same day at 1130 hour in the presence of bidders or their authorized representatives in Committee room of Pakistan Museum of Natural History, Islamabad. The Tender Documents/BOQ may be obtained from the undersigned on cash basis during the office hour on any working day from the date of publishing of this Notice. Pakistan Museum of Natural History, Islamabad is a scientific organization working under the administrative control of Ministry of Science & Technology intends to purchase Scientific Equipment, and invite sealed bids from well-reputed Dealers/Firms and General Order Suppliers having NTN, GST No and on Active Tax payer List (ATL) and having experience in the Laboratory Equipment in different public sector organizations. All interested parties may send their quotations in sealed cover along-with 2% of the total quoted price as earnest money in the shape of pay order or Bank draft in favour of Pakistan Museum of Natural History, H-7 garden Avenue Shahkarparian, Islamabad on or before 06-06-18 or next working day in case of holiday, up to 1100 hour and their bids shall be opened on the same day at 1130 hours in the presence of bidders or their authorized representatives in Committee Room of Pakistan Museum of Natural History, Islamabad. The Tender Documents can be obtained from the undersigned during the office hours on any working day from the date of publishing of this Notice. Pakistan Museum of Natural History, Islamabad is a scientific organization working under the administrative control of Ministry of Science & Technology intends to dispose off/sale out following condemn/unserviceable items/Scrap materials lying in Pakistan Museum of Natural History, Garden Avenue, Shakarparian, Islamabad on 30-04-2018 at 11.00 a.m. in the Audio Visual Hall of PMNH. Persons participating in the bidding shall be eligible to take part in it by depositing an earnest money of Rs. 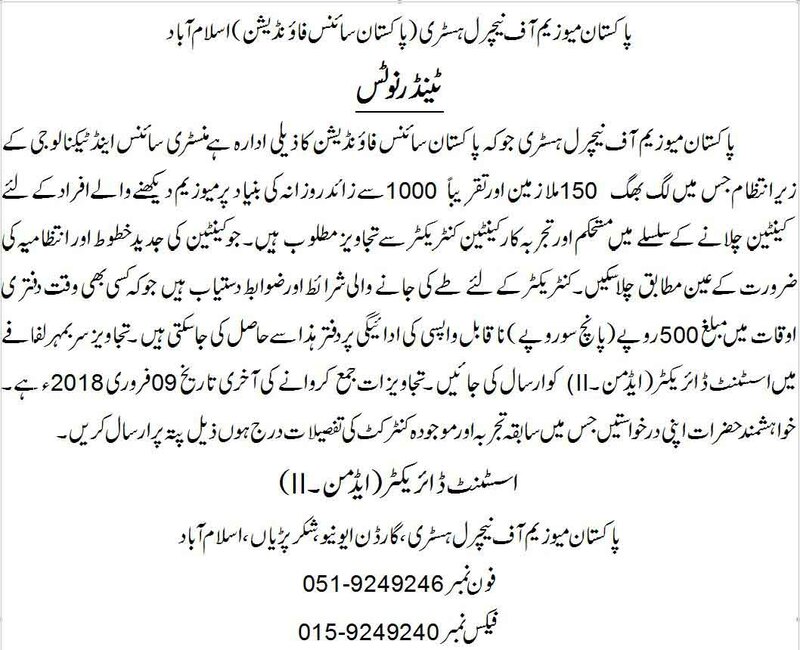 50,000.00 in the shape of call deposit along with copy of identity card in favour of Additional Director (Admin), PMNH, Islamabad. OTHER TERMS AND CONDITON S ARE AS FOLLOW. Auction shall be held on as is where is basis. Contractor will have to submit his CNIC with CDR as guarantee before giving bid, which will be returned to all bidders except to the 1 st, 2 nd and 3 rd successful bidders. Successful bidder shall be bound to deposit Income Tax in advance under the prevalent rules. The inspection of above items can be done by contractor at Pakistan Museum of Natural History, Garden Avenue Shakarparian, Islamabad during working hours i.e. 08.00 a.m. to 04.00 p.m. Successful bidder shall have to deposit remaining amount within 05 days. If successful bidder fails to deposit the remaining amount his CDR will be forfeited. Successful bidder shall be awarded contract after final approval of auction. Pakistan Museum of Natural History intends to hire the services of a reputable Architecture/Consultant Engineering Firm (registered with tax departments of Federal and Provincial governments in accordance with the applicable laws) to undertake all necessary assignments for conducting feasibility study for the completion of Pakistan Museum of Natural History building at Islamabad. Detailed Request for Proposal (RFP), evaluation criteria and other related information for the purpose can be purchased at a cost of Rs.500/- from the address given below. “Single Stage Two Envelop Procedure” will be used for open competitive bidding. The interested Architecture/Consultant Engineering Firms will submit their sealed bids comprising single package containing two separate envelops. Each envelope shall contain separately the “financial” and “technical” proposals which will be clearly mentioned in bold and legible letters on respective envelop to avoid any confusion. RFP found not in accordance to the terms and conditions specified in the documents will be rejected forthwith. Incomplete tenders will be rejected straight away. Sealed documents shall be submitted on or before 30 th Oct, 2017 at 11:00 am. At the first stage, only technical proposals shall be opened on the same day at 11:30 am in the presence of representatives of the participating firms/consultants. The competent authority of Pakistan Science Foundation may reject any or all bids / proposals at any time prior to acceptance of the bids/proposals as provided under rule-33 of PPRA Rules-2004. Pakistan Museum of Natural History, Islamabad is a scientific organization working under the administrative control of Ministry of Science & Technology intends to purchase Electric Generator (150 KVA), Laboratory Equipment, Lab Furniture and Fixture, and Renovation of Lab and invite sealed bids from well-reputed Dealers/Firms and General Order Suppliers having NTN, GST No and on Active Tax payer List (ATL) and having experience in the Laboratory Equipment in different public sector organizations. All interested parties may send their quotations in sealed cover along-with 2% of the total quoted price as earnest money in the shape of pay order or Bank draft in favour of Pakistan Museum of Natural History, H-7 garden Avenue Shahkarparian, Islamabad on or before 25-09-17 or next working day in case of holiday, up to 1100 hour and their bids shall be opened on the same day at 1130 hours in the presence of bidders or their authorized representatives in Committee Room of Pakistan Museum of Natural History, Islamabad. The Tender Documents can be obtained from the undersigned on cash payment basis during the office hours on any working day from the date of publishing of this Notice. Pakistan Museum of Natural History, Islamabad is a scientific organization working under the administrative control of Ministry of Science & Technology. It intends to renovate Display Galleries and invite sealed bids from well-reputed Firms and General Order Suppliers having NTN, GST No. and are on Active Tax payer List (ATL) having experience in laying of Master (Glace Ceramic) Tiles (2’x2’) (A Grade) Superior quality (Half Body) or Equivalent in different public sector organizations. All interested parties may send their quotations in sealed cover along-with 2% of the total quoted price as earnest money in the shape of pay order or Bank draft in favour of Pakistan Museum of Natural History, H-7 Garden Avenue Shahkarparian, Islamabad on or before 24-08-2017 or next working day in case of holiday, up to 1100 hours. The bids shall be opened on the same day at 1130 hours in the presence of bidders or their authorized representatives in Committee Room of Pakistan Museum of Natural History, Islamabad. The Tender Documents/BOQ may be obtained from www.ppra.pk www.pmnh.org.pk websites or collected from undersigned during the office hours on any working day from the date of publishing of this Notice. Pakistan Museum of Natural History, Islamabad is a scientific organization working under the administrative control of Ministry of Science & Technology intends to purchase Scientific Equipments and invite sealed bids from well-reputed Firms and General Order Suppliers having NTN, GST No and on Active Tax payer List (ATL) and having experience in the Scientific Equipments in different public sector organizations. All interested parties may send their quotations in sealed cover along-with 2% of the total quoted price as earnest money in the shape of pay order or Bank draft in favour of Pakistan Museum of Natural History, H-7 Garden Avenue Shahkarparian, Islamabad on or before 24-04-2017 or next working day in case of holiday, up to 1100 hour and their bids shall be opened on the same day at 1130 hours in the presence of bidders or their authorized representatives in Committee Room of Pakistan Museum of Natural History, Islamabad. The Tender Documents/BOQ may be obtained from the undersigned during the office hours on any working day from the date of publishing of this Notice. 1) Pakistan Museum of Natural History is a scientific organization working under administrative control of Ministry of Science & Technology intends to invite sealed bids from well-reputed Contractors/builders having NTC, GST No. and on Active Tax Payer List (ATL) and who posses experience in Renovation of Display Galleries. 2) All interested parties may send their quotations in sealed cover, along-with 2% of total quoted price as earnest money in the shape of pay order or Bank draft in favour of Pakistan Museum of Natural History, H-7, Garden Avenue, Shakarparian, Islamabad on or before 21 November, 2016, or next working day in case of holiday, up to 1200 hour and their bids shall be opened on the same day at 1230 hours in the presence of bidders or their authorized representatives, in Committee-Room of Pakistan Museum of Natural History, Islamabad. Incomplete bids and bids to be received after the opening time will not be entertained. 3) The Tender Documents/BOQ may be obtained from the undersigned during the office hours on any working day from the date of publishing of this notice. Orientation meeting for the same will be held on 14 November, 2016 at 11:00 a.m.
Pakistan Museum of Natural History, Islamabad is a scientific organization working under the administrative control of Ministry of Science & Technology intends to organize National Science Fair 2016 and invite sealed bids from well-reputed Event Organizers, General Order Suppliers having NTN, GST No and on Active Tax payer List (ATL) and having experience in organizing the events in different public sector organizations on hiring basis for a period of Seven days. All interested parties may send their quotations in sealed cover along-with 2% of the total quoted price as earnest money in the shape of pay order or Bank draft in favour of Pakistan Museum of Natural History, H-7 garden Avenue Shahkarparian, Islamabad on or before 17-11-2016 or next working day in case of holiday, up to 1200 hour and their bids shall be opened on the same day at 1230 hours in the presence of bidders or their authorized representatives in Committee Room of Pakistan Museum of Natural History, Islamabad. The Tender Documents/BOQ may be obtained from the undersigned during the office hours on any working day from the date of publishing of this Notice. Orientation meeting for the same will be held on Monday 7 th November, 2016 at 11.00 a.m.